Astronomers have used the Multi Unit Spectroscopic Explorer (MUSE), attached to ESO’s Very Large Telescope (VLT) at the Paranal Observatory, to take advantage of a once-in-a-lifetime opportunity to test their understanding of massive clusters of galaxies. They are making the first ever prediction of an observational event in the distant Universe before it actually becomes visible. 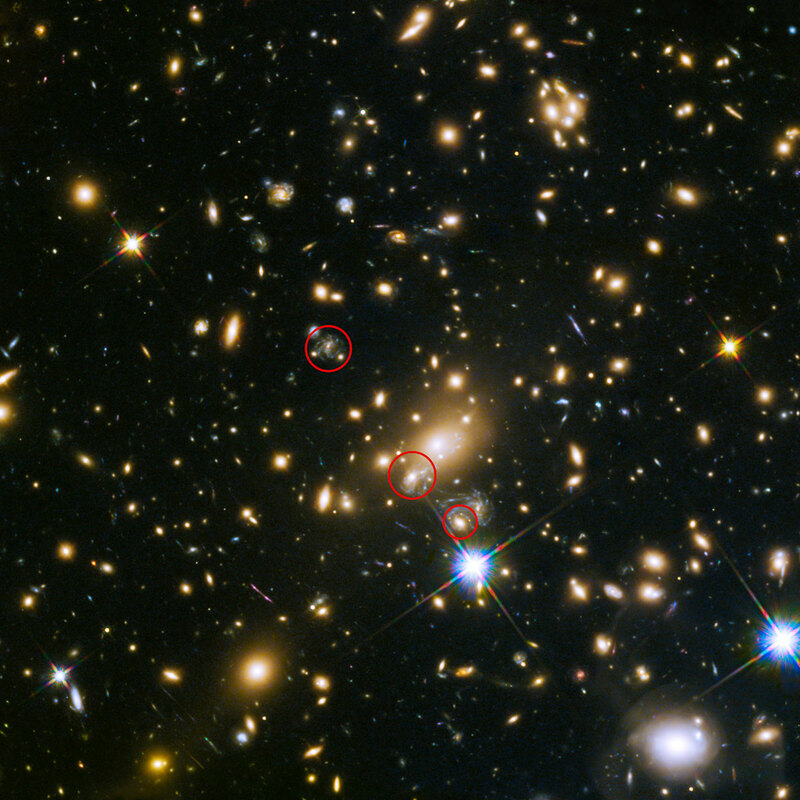 Images of the galaxy cluster MACS J1149+2223, taken by the NASA/ESA Hubble Space Telescope in November 2014, revealed a distant exploding star — a supernova — like no other ever seen. Nicknamed Refsdal , it is the first supernova to be split into four separate images through the process of gravitational lensing, forming an almost perfect Einstein Cross around one of the cluster’s galaxies. Gravitational lensing is a consequence of Einstein’s theory of general relativity. The paper stating the equations of this fundamental change in our understanding of gravity was published on 25 November 1915, exactly one century ago. Critical observations of the precise distances to galaxies in the region of MACS J1149+2223 were made using MUSE in early 2015. They have enabled astronomers to model the matter distribution inside the behemoth galaxy cluster more precisely than ever before. This has led to several predictions of when and where another image of the distant supernova — an instant replay on the biggest screen imaginable — will appear. Because the light that forms the multiple images of the supernova takes paths to the Earth with different lengths, they appear at different times as well as at different points on the sky. 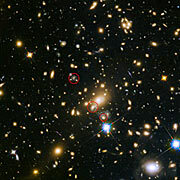 Using all the available MUSE data, in combination with Hubble observations, a team of astronomers led by Claudio Grillo (Dark Cosmology Centre, Niels Bohr Institute, University of Copenhagen, Denmark) have predicted that a further replay will peak in brightness between March and June 2016, with a possible first detection before the end of 2015. They can also anticipate not only where and when the supernova is expected to become visible again, but also approximately how bright it will appear. Hubble is now being periodically pointed at the cluster in hopes of catching the once-in-a-lifetime event, putting the astronomers’ models to the ultimate test in the process. These observations highlight the vital role that MUSE and the VLT play in the exploration of the distant Universe, as well as the synergy between Hubble and ground-based observatories. It is named after the late Norwegian astronomer Sjur Refsdal, who was a pioneer of the study of gravitational lenses.